New Madison council awarded a $662,900 bid for construction of the village’s new water tower. The current tower is more than 80 years old. 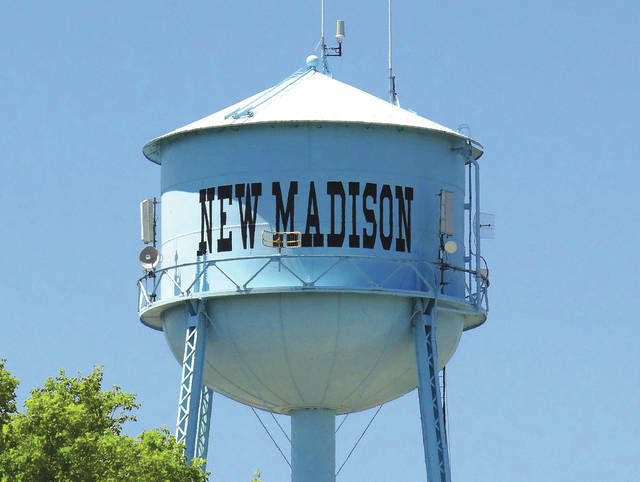 NEW MADISON — The Village of New Madison passed ordinances, discussed instituting a curfew and awarded a bid for construction of a new water tower at its first council meeting of 2019 on Monday evening. At the top of Monday’s meeting, Mayor Monyca Schlechty expressed appreciation for Street Commissioner Duane Cook, citing “all he did to keep [New Madison’s] streets clean and passable” during the recent snowstorms. Schlechty and other council members said they had received calls and read social media posts praising Cook’s efforts. A $662,900 bid for construction of the village’s new water tower was awarded to Caldwell Tanks, Inc., a company based in Louisville, Kentucky that designs and fabricates tanks for the water, wastewater, grain and coal industries. Caldwell came in with the lowest bid, beating competitors Phoenix Fabricators and Erectors, of Avon, Indiana, and Maguire Iron of Sioux Falls, South Dakota. New Madison’s current water tower is over 80 years old and requires frequent repairs, according to village Fiscal Officer Roberta Hocker. The village received a $400,000 grant and a $600,000 loan from the Ohio Department of Public Works to fund construction of the new tower, which may begin as early as this spring. The passage of a curfew ordinance aimed at keeping “unruly juveniles” off New Madison’s streets was briefly discussed. A copy of the proposed ordinance was approved by Darke County Sheriff Chief Deputy Mark Whittaker and distributed to the council members for their review at a meeting held Dec. 17; passage is apparently being postponed pending determination of exactly what the council will define as an unruly juvenile. Council passed an ordinance to add the day after Thanksgiving and the day after Christmas to the list of paid holidays for New Madison’s two municipal employees, as well as a resolution allowing the council to enter into a contract with the New Madison Community Volunteer Fire Department for fire protection services. Council also discussed instituting a program to collect used prescription medication bottle caps for the purposes of being recycled as building material for benches to be placed on the village’s sidewalks, but no firm decision was made to move forward with the plan. Finally, council President Karl King was nominated and ultimately re-elected to that post, which he took up in April 2018 following the resignation of former mayor Lisa Garland, and ordinances were passed re-appointing Roberta Hocker as fiscal officer, tax administrator and utility clerk for the Board of Public Affairs. Duane Cook was appointed as street commissioner, a post he has held since August of 2015. This entry was tagged Curfew, New Madison, New Madison Community Volunteer Fire Department, New Madison Council, Ohio Department of Public Works, Village Council, Water tower. Bookmark the permalink.